In the past, the Coalition has urged the Security Council to enforce its referral of the situation in Darfur to the Court and to do more to facilitate the arrest of suspects. The continued travel abroad of ICC suspect and Sudanese President Omar Al-Bashir received specific attention from both the prosecutor and Security Council members, with several states calling on ICC state parties to abide by their obligations to arrest and surrender him. A number of states—including Luxembourg, Argentina and France—condemned ICC member states that had accepted visits from Al-Bashir rather than arresting him. 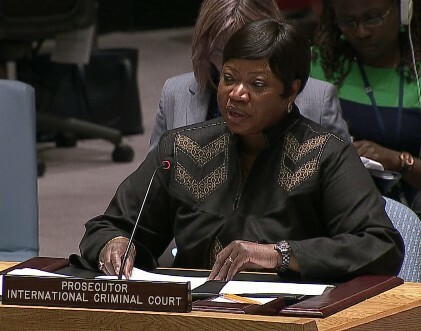 Bensouda also criticized the Sudanese government itself for failing to act on the ICC arrest warrants and for not taking any steps to provide justice or security for victims at a national level. Additionally, the prosecutor condemned the Sudanese government’s alleged continued use of indiscriminate violence against civilians and attacks on peacekeepers. She called for the UN to investigate recent allegations that reports of alleged attacks against civilians and peacekeepers by Sudanese government forces were covered up by the joint AU-UN peacekeeping mission in Darfur (UNAMID). Several Council members also called for an inquiry into the allegations. This week, Human Rights Watched echoed those calls, and added that a requirement to regularly and publicly release its human rights reports should be added when the Security Council considers renewing UNAMID’s mandate in August. Bensouda also stressed that an increase of sexual and gender-based violence in Darfur deserves the immediate attention of the Security Council.